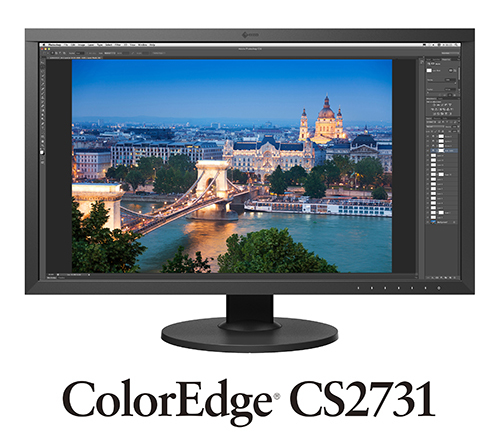 Hakusan, Japan, April 4, 2019 – EIZO Corporation (TSE: 6737) today announced the new ColorEdge CS2731 – a 27-inch color management monitor for enthusiasts in photography, illustration, video creation, and other creative fields. It is the successor to the ColorEdge CS2730. The monitor’s wide color gamut reproduces 99% of the Adobe® RGB color space, ensuring colors are reproduced faithfully. To counter fluctuations in brightness and chromaticity characteristic of LCD monitors, EIZO’s unique digital uniformity equalizer (DUE) corrects deviations in every tone across the screen for stable display. 2 Usage time is limited to 30,000 hours. EIZO, the EIZO logo, and ColorEdge are registered trademarks of EIZO Corporation in Japan and other countries. All other company names, product names, and logos are trademarks or registered trademarks of their respective companies.